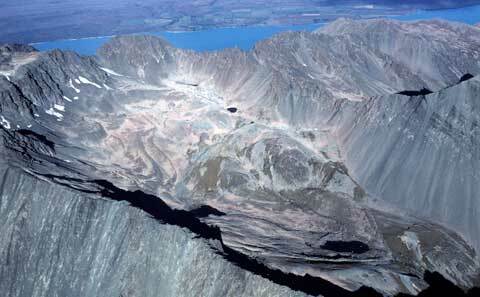 High in the Ben Ohau range to the west of Lake Pukaki in the South Island’s Mackenzie basin, the glacial moraines in the Irishman Stream Basin (Google Map) are providing important confirmation that the southern hemisphere warmed during a rapid northern hemisphere cooling event at the end of the last ice age. In a new paper in Nature, Glacier retreat in New Zealand during the Younger Dryas stadial Michael Kaplan and a team including three NZ scientists reconstruct the retreat of the glacier that used to fill the basin. The team dated the sequence of moraines (piles of rock left by the retreating glacier) by measuring the “cosmogenic” beryllium isotope (10Be) in quartz crystals in the rocks — formed by bombardment by cosmic rays — giving a measure of how long the rocks have been exposed to the sky. By modelling the amount of ice in the valley at various moraine positions, they were able to reconstruct the glacier’s decline as the local climate warmed. Our late-glacial glacier chronology matches climatic trends in Antarctica, Southern Ocean behaviour and variations in atmospheric CO2. The evidence points to a distinct warming of the southern mid-latitude atmosphere during the Younger Dryas and a close coupling between New Zealand’s cryosphere and southern high-latitude climate. These findings support the hypothesis that extensive winter sea ice and curtailed meridional ocean overturning in the North Atlantic led to a strong interhemispheric thermal gradient during late-glacial times, in turn leading to increased upwelling and CO2 release from the Southern Ocean, thereby triggering Southern Hemisphere warming during the northern Younger Dryas.